Unsubscribe option is mandatory in your email campaigns. This helps in keeping up your email reputation. Give your subscribers the liberty to exit if and when they want. That keeps your email list clean and saves you from getting marked as spam. Inside Aritic PinPoint, you can configure your email unsubscription preferences from the ‘Settings’ option. Here you can customize the unsubscribe link and token text which can be used directly within all your outgoing email campaigns. You can use these settings to configure ‘confirmation text’ for unsubscription and ‘re-subscribe confirmation text’ for all outgoing emails that are either segmentation-based or are marketing automation campaigns. 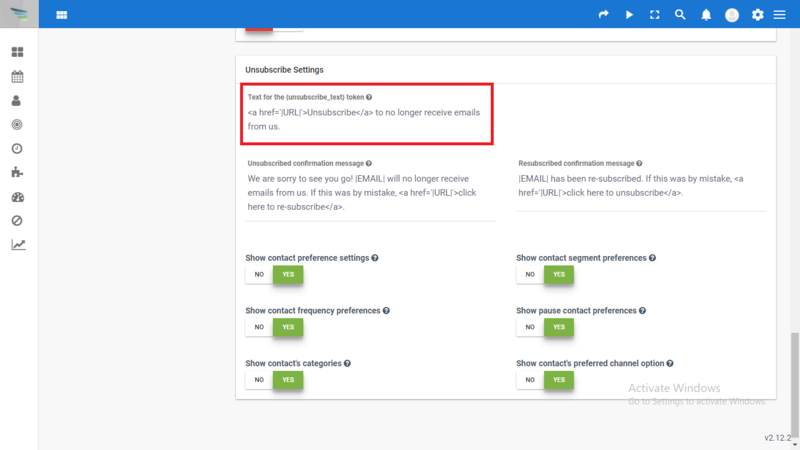 Follow the following steps in order to Setup Unsubscribe Email Preferences. 1. Login to Aritic PinPoint Dashboard. 2. On the top right corner of Aritic PinPoint Dashboard, go to Settings >> Configuration. 4. Click on “Email Settings”. 5. Select “Unsubscribe Settings”, here you can define your own unsubscribe link and message. Also, you can make changes according to your requirement. Note:- For change the unsubscribe link style as you want as a mark in the screenshot.